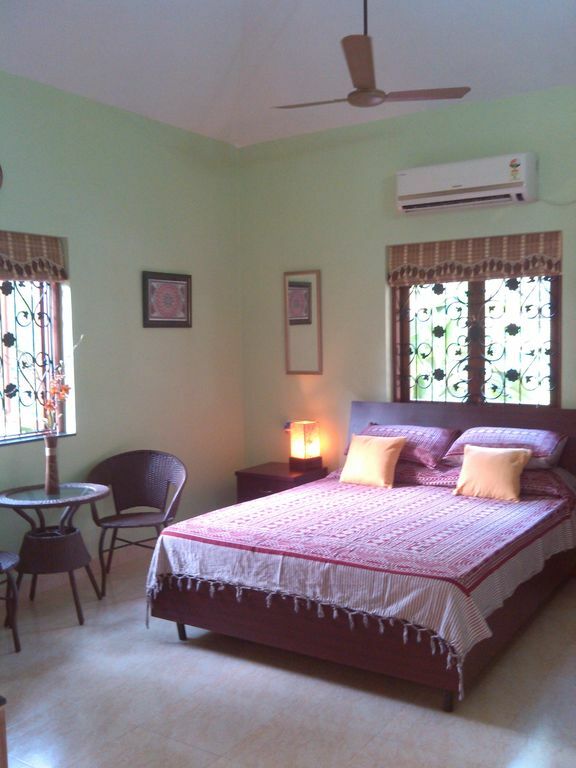 This property is situated on the edge of Majorda village, midst rice fields & coconut trees. A compound wall & gate keeps the area safe and private in which the studios and the main house have complete privacy. Gardens surround the main house and studio , with ample place to find your own space. A large shared veranda overlooks the pool, garden and fields ,A place to chat with everyone too.,with 3 bistro style tables and chairs a chaise-lounge ,and a bookcase filled with a good variety of books in various languages. The 3 Studios are fully furnished and all utensils are provided. The ceilings are high,keeping it cool ,but all have fan and A/C. The bathrooms are spacious too with an open shower area(wet room) ,a tiled seating platform.. The pool area has a BBQ and sun loungers and table & chairs,and is elevated from the field so one has a wonderful unobstructed view of nature. A relaxing place to watch the buffaloes graze,and in the monsoon a marvelous scene of fresh green paddy. It's also a tranquil space to work from your laptop,(wi-fi is available ) if you are a traveling business person. Lounging by the pool with a good book,writing a novel, or enjoy doing nothing ! If you are artistic we are able to offer art classes with a local artist. We have a wonderful dentist too in the village ,who has an extremely good reputation with overseas clients,so you could combine your holiday with dentistry. I will contact Dr.Liza. and put you in touch with her so you would have a time period. Majorda is close to the beach ,which is not too busy ,and life guards patrol daily. Here you 'll find beach shacks where you can relax on the sunbeds under the shade of a coconut leafed umbrella.This starts around mid November . The beaches continue for many kilometers, Cycling and walking early morning or evening is a wonderful way to keep fit,also another great place for walks or cycling is along the windy quiet village roads close to our property. Transportation : Scooter and car hire can easily be arranged. We hire cycles and a scooter from our home . Buses go frequently to all villages & cities from the end of the main road. Highway N17 is a few minutes away ,leading to Panjim, 45 minutes, & Dabolim Airport 20 minutes drive. The surrounding villages have local arts & crafts shops and plenty of restaurants.to choose from. Born in Yorkshire, England I set off to travel the globe. On my way I met my husband Noris in Bermuda, where we lived for 11 years and have 1 daughter. I always had a love for India and had many trips to different parts. Our dream was to have a guest house in Goa, my husband's home land. In 2008 we bought our house and in 2009 began building our guest house. Within this tranquil space we find the peace from the chaos of the "outside world" we live in at present .It's as if we're living at the speed of light ,and a pace determined by machines,here we live at the speed of life . I like to do yoga ,and health is always a priority for me .my family and guests ,so I'm always helping by introducing Yoga and Ayurveda. We now offer Yoga classes in the morning by the pool The view all around is wonderful, lush gardens, coconut trees, which we pluck and make oil, the rice fields and watch the variety of birds and the eagles soar above. We take morning walks at Majorda Beach then have tea at one of the beach shacks and relax in their lounge chairs. We are in the midst of nature, but within minutes we go to the city, the beach and the airport. We love it and want our guests to love it too. What this property has is the private ground space..It's unique benefit is the total tranquility ,complimented by so many . A large veranda overlooking the garden and fields, where you can sit with your tea or G'n'T, watching them plough the land and plant the rice,or in the evening watch the sun set, and see the buffaloes go home whilst having dinner. Tranquility,a place to relax and rejuvenate is a priority and the cleanliness of our environment. The gardens and the pool are in a luxurious private setting of 2500 sq.m. The outer perimeter of the property has only a few other dwellings, no one to overlook you. I like the fact that within minutes I can be in the city for shopping, close to the airport to pick up my family,and guests. Cycle down to the beach. A jog or walk in the friendly neighbourhood of the local villagers. is a kitchenette with every item in it I could possibly think of ! It's your choice where you'd like to dine ! Be it on the veranda, garden or by the pool. Or in your room. And Noris' kitchen is open for evening meals on request. I'd like to add that although we say there is no House Keeper , I have your floors cleaned regularly .No one really wants to clean floors on holiday !. There is cleaning liquid and clothes in the studios and in the outside store room on the veranda you'll find brooms and buckets ,mops ,mosquito repellents ,candles Drying racks for laundry. Outside: A private compound of 2500 sq.m.Lush gardens of lawns ,coconut trees, mango trees and other flowering shrubs Outside area has plenty of space for privacy for the individual,with garden furniture and sun loungers by the pool with shady spots from the coconut trees. Garden / pool lighting creates a relaxing atmosphere for dining and socializing We have a unique BBQ , designed by myself, by the pool ( BBQ on request ) The pool is a small kidney shape, it is all one level at 1m 50 approx, and 6 m in length. We even have a portable stage for entertainment ,and love to create little personal events. Quiet oasis in the heart of crazy Goa! Having been to Goa several times over the past 24 years and we love it-we decided to do things differently this time. We stayed here for our first week of our one month holiday. (Stayed one week in 4 different places). Noris picked us up from the airport.We had a lovely welcome at Fernlodge when we arrived in the middle of the night.A drink and lovely chicken kebabs. The room was pleasant with a comfortable bed.the whole area was lovely and peaceful.We didn't get out and about too much as my husband never drives when we are on holiday. Noris or Yvonne took us to the supermarket/ beach etc and Noris drove us to our next destination in nearby Colva. We would definitely recommend Fernlodge to anyone who wants a lovely quiet holiday.Ideal if you lead a busy lifetyle and want to de-stress. My husband, Noris, is an avid chef and previous restaurant manager. He would like to offer anyone interested in Indian/Goan cuisine a cooking lesson. A trip to Pala Farm, a personal friend,Her property of 50.000 acres of forest . Find a picnic spot, a swim in the dam ,a trek in the forest . She owns horses and is the Horse Whisperer of Goa ,also a dog trainer and breeds Weimeraner. She is open to visitors during February till November Your trip to Pal Farm can be arranged for those that want to get away from the beach and enjoy the Goan countryside. We offer Ayurvedic consultations by Dr. Prafulatta Rajput All treatments given at her clinic. Combine you holiday with Dentistry with Dr Liza. (email can be provided on request ).Her clients are from around the globe and she has a great reputation . Goa is so lush and green this time of the year so a hike in the forest is a great experience .There are various hiking groups which have a bus leaving from Margao city to the destination . Spice Farms : One of my favorite places to visit and overnight is Tanshikar Spice Farm in Netravali about 25 km south west from Majorda .delicious homemade food ,served in clay pots . The beaches stretch all along the the south coast, our local beaches are within easy range of 5-15 minutes by bike, bus or car. From October through April there are many "Beach Shacks " serving very tasty food from AM to PM. They offer lounge chairs under the shade of the coconut leaf umbrella. Majorda Beach is a quieter beach, has good hard sand and is great for cycling and morning walks. Also in the morning it is interesting to watch the small fishing boats bring in their catch of the day. Dabolim Airport is 20 minutes drive by car from Majorda . The Konkan Railway runs from Mumbai to Margao, Majorda is 15 minutes from Margao. Buses leave regularly from Mumbai to Goa stopping at Kadamba Bus Terminal, a 10 minute drive from Majorda. Pick up and drop off from these points is available . Scooter & cycle hire is available. Cycling is a great way to get to the beach and takes 15-20 mins. Hire a cycle or motorcycle, tour lanes of the villages which pass through the coconut groves. In Margao city crowded colourful markets provide a definite slice of traditional India. Walking distance from the house (Dongorim, Majorda) there are some general stores which provide such things as milk, sugar, soft drinks, toiletries and vegetables etc. Further into Majorda there are stationary stores,a cycle repair shop and the Post Office directly opposite the railway station. A short distance further is a large European standard Supermarket selling all your needs, as well as dealing with Western Union. Next to the Supermarket is the State Bank of India. Over the railway tracks to the beach side of Majorda are selection of restaurants for lunch & dinner, plenty of seafood and local specialties. Majorda Beach Resort has a fabulous buffet for Christmas & New Year with dancing and live bands. In Betalbatim " Martin's Corner " is an incredibly popular Goan restaurant and one of the best places around for an ambient but casual lunch or dinner,offering a variety of local and international cuisine. All restaurants have live music. A short distance on the highway is the village called Verna, here a well know restaurant "A Lua Verna ", in a beautiful old Goa style with hill views. Ayurvedic Centers -There are various centers around the villages. Tours to Dudhsagar on the eastern border to Karnataka, Goa's most impressive waterfalls, at there best during the monsoons. Accessible only by 4WD. Bondla Wildlife Sanctuary, 52km from Panjim and easy to reach from Margao. Trekking tours Netravali, Sanguem. 2 hours drive from Margao. Booking Notes: A booking deposit of 50% is require via Bank transfer. or western Union Balance due on arrival date, plus a Damage Deposit of 20 GBP, refundable on departure, baring no damages. . Dates will be held pending receipt of booking deposit for 7 days. Payment of the deposit constitutes acceptance of the booking conditions. Cancellations: 50% deposits are non refundable .Cancellations or date changes 2 weeks prior to arrival are not acceptable and may result in charges of 5 GBP per day. Changeover Day: Depending on flight arrival times from Europe. : Standard Check in : Flexible . Check out at 11 am. Late check out will be charged as per night .